Updated Meadowbrook twinhome with custom upgrades throughout. This beautiful three bedroom, two & a half bathroom home features bamboo flooring on the first floor, carpet on the second floor. The open kitchen features stainless steel appliances, granite counters, center island, cabinets with built-in pullout drawers, custom dining nook with built-in storage bench & view to low maintenance backyard. The master bedroom features a walk-in closet with custom shelving system & attic storage space access with hide-away ladder. The updated master bathroom is sure to impress with its dual sinks, soaking tub & separate shower. Two additional bedrooms, a bathroom & laundry room with built-in utility sink & cabinet are located upstairs. A custom loft in one of the bedrooms adds to the usable space. The inviting backyard includes newly painted pergola & water-wise turf to make the most of outdoor entertaining! Additional features include newer water heater, water purifying system, air conditioning, two-car garage with built-in wall cabinets & ceiling storage, updated faucets & toilets in all bathrooms, newly painted garage door & trim, LED lighting as well as custom window casings & baseboards. 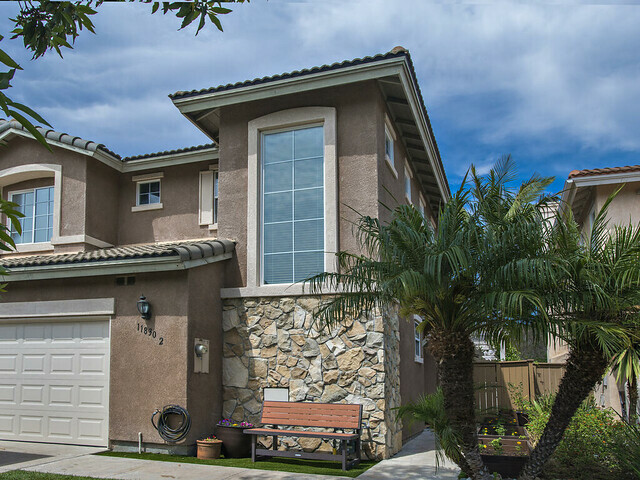 Situated across the street from Butterfly Park & Scripps Ranch Community Center, a pathway from the community leads to Ellen Browning Scripps Elementary School & to Scripps Ranch Recreation Center. The Meadowbrook community features a tot-lot conveniently located at the end of the street. Catrina brings marketing, sales, management and customer service experience to the forefront with her passion for understanding and being dedicated to her clients. Her attention to detail and her commitment to meeting her clients’ needs are an asset. Having moved several times with her family, she understands the importance of finding the right home and community for your family’s needs. As a military spouse she brings her knowledge of permanent change of station (PCS) moves and relocations to better serve her clients. It’s your move®, let Catrina show you the way home!